I love races! I don’t love holidays, but I do enjoy movement and race companies like to create races on various holidays. Here in the USA, Thanksgiving is a good day for 5K races. All the eating that happens this day is excellent motivation to start the day off with some running and walking. I haven’t gotten together with biological family for Thanksgiving in many, many years, so not having contact with my biological family for this holiday isn’t new. 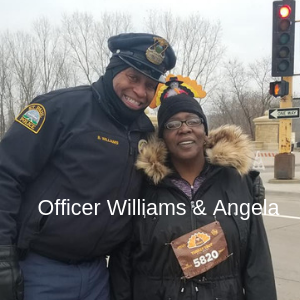 I’ve been living in Minnesota since September 2012 and starting on Thanksgiving 2014, my friend Tammy McLemore and I have been entering and doing the Saint Paul Turkey Trot every year. As you know, I have type 1 diabetes and Tammy has type 2, so we especially like to kick off the day with movement. 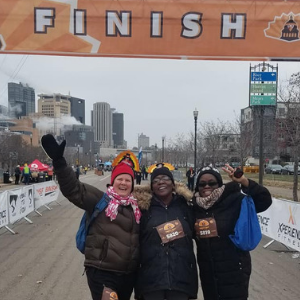 Tammy was looking at all the various Turkey Trots in the Twin Cities and she selected the Saint Paul race because they give out beautiful medals at the finish line. Tammy likes medals! I agree with Tammy! This year, I was reflecting on why it’s so wonderful to do the Turkey Trot every year. I came up with three reasons. What do you think? Let me know your thoughts, I love hearing from you! I love seeing the fun costumes that people put together for the Turkey Trot. One group of five all had turkey outfits on, they made me laugh out loud! In general, being around people who are happy and are doing something healthy and wise to get the day going is just AMAZING! One police officer is on one particular corner every Thanksgiving. Seeing Officer Williams giving high fives and cheering everyone on every year, brings a big smile to my face. In short, an instant sense of community and purpose is created. Crossing that finish line and getting that medal makes me smile ear to ear! The feeling of having done something healthy and good for me stays with me all day. It will stay with you too!!! 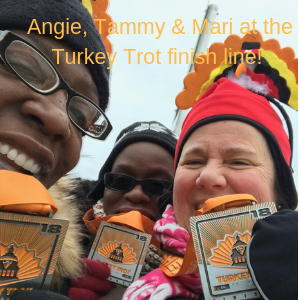 This year Tammy and I did the Turkey Trot with Tammy’s developmentally delayed sister, Angela. This was her first 5K EVER!!! This was a major HUGE accomplishment. Seeing Angela’s joy and delight at doing the event was extra magical. I confess, I am a major fan of athletic wear. In fact, one of the best things about owning Team WILD Athletics LLC for six years was that I got to wear athletic clothing for nearly everything. It’s true, athletic clothing is my all-time favorite clothing. And for the $30 race entry fee, for the Saint Paul Turkey Trot you get a wonderful long sleeved athletic shirt!! Plus, you get a wonderful medal, Tammy’s favorite!! Here are the five medals I have in my Turkey Trot collection so far! Do you do races on holidays? I’d love to hear your thoughts on holiday racing!! I have never been in a race, walking or running! But I have done walks for breast cancer and JDRF in the past. Doing those walks was definitely exhilarating. Once I get this knee back in shape, I will start walking again. And who knows, maybe the next JDRF walk is in my future! I have no doubt that you will be walking before long!!! And JDRF will be looking forward to you joining in! Walking with others is exhilarating! I love your use of that word. Way to go! I have never entered a holiday race. I am not a runner. I do, however, power walk 40 minutes 4-5 times per week. I turn 59 tomorrow and after reading your blog, I realize I probably could and should enter a race that allows walkers. Thanks for the inspiration. I am going to look for a race to enter in. Even though I am a “gym rat”, I shy away from activities that are not In my comfort zone because of my Type I diabetes and my fear of going low. After seeing your blog and all the things you do, I realize I need to go outside of my comfort zone and start taking some chances. Thank you!! You just made my day!!! Power walking 4-5 times a week for 40 minutes each time FOR SURE qualifies you to do a 5k race!!! Walking a race is completely allowed! The fear of going low is a real fear, that’s for sure!!! My secret to success is always having my tester or CGM with me/on and always having a fast glucose supply on my body. I love it that fanny packs are in style again! Be sure to let me know what race you enter and tell me how it goes!!! With love and support for your new adventure!